Singe Gaze is set to make a comeback for the racetrack this year. This is after a horrific fall that almost ended her racing career as well as that of her jockey. While they both barely escaped the tragic event unharmed, her handlers decided that she would not race anymore. Katsumi Yoshida bought her with the agreement that she would never race again. Rather, she was then taken to a horse breeding farm. Her new handlers are yet to honor that agreement as they are planning on bringing Single Gaze back to the race track. The handshake agreement that Single Gaze’s initial handlers made with the new owners does not seem to faze them. It is clear that the Yoshida is looking to make more money from her. Working in a horse breeding farm and racing for prize money is a prospect that the new handlers could not resist. Horse racing brings in millions of dollars every season for the people involved. For a horse like Single Gaze, the chances of winning more prize money are many. 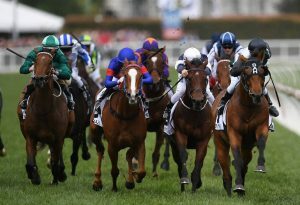 There is a high chance that she will race at the Caufield and Melbourne Cups this year. Over the years, Single Gaze has had a sterling career on the racetrack. Together with her jockey, the two have managed to earn more than $2 million. This single gaze one exceptional horse. It would explain why Yoshida would allow her to go back on the racetrack instead of sending her to Japan where she was to mate a champion stallion, Deep Impact. Deep Impact has earned close to $ 18 million in his lifetime. Considering the seriousness of an equine injury, there are valid concerns as to whether Single Gaze will be able to perform again. The initial owners had decided to stop her from racing to prevent further injuries. These injuries could cause both her death and that of her jockey on the field. However, the owner seems confident about the horses’ health. This, therefore, leaves Olive, her trainer, wishing her all the best and wishing that she would Kathy, her former jockey, works with her. Single Gaze’s come back will put her on the spotlight after a period of time. If everything goes well for Single Gaze and she is able to race, she will be facing a younger version of herself called Sizzling Belle. Copyright © 2019 patinackfarm.com. All Rights Reserved.